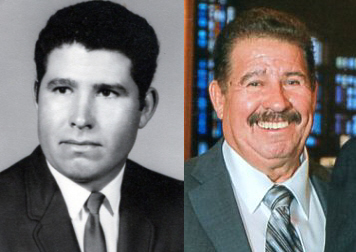 Rosary for Richard T. Maldonado, 72, of Lubbock, will be Friday, November 23, 2018 at 6 PM in The Chapel of Broadway Funeral Directors. A Funeral Mass will be celebrated 10:00 am, Saturday, November 24, 2018 at St. Elizabeth's Catholic Church with Father Emiliano Zapata officiating. Burial will follow in The City of Lubbock Cemetery under the direction of The Broadway Funeral Directors. Richard went to be with the Lord on Monday, November 19, 2018. He was born on December 2, 1945 in San Antonio to the late Florentino and Elodia Maldonado. He married Eleanor Garcia in Lubbock and was an avid catholic and active member of St. Elizabeth Catholic Church. He was an outstanding welder, a hardworking man and always provided the best life he could for his family. He will always be remembered by the amount of love he had not only for his children but also for his grandchildren. He is preceded in death by his wife Eleanor G. Maldonado; his parents Florentino and Elodia Maldonado; brothers, Manuel Maldonado, Raymond Maldonado; a grandson, Vincent Scott Calvillo. Survivors include his two sons, Chris Perez (JoAnn Saldana) of Lubbock, Ricardo Maldonado (Ana Maria) of Euless; a daughter, Vanessa Perez (Shelby Lindsey) of Lubbock; a brother, Ray T. Maldonado(Linda) of Lubbock; sisters, Mary M. Lopez of Abernathy, Julia Gonzales(Pedro) of Lamesa, Janie Vidaurrie of Lamesa, Susanna Maldonado of Lubbock; two granddaughters, Chelsea Adrian Calvillo of Lubbock, Isabella Marie Maldonado of Euless; two grandsons, John Cameron Calvillo of Lubbock and Ethan Christian Maldonado of Euless.